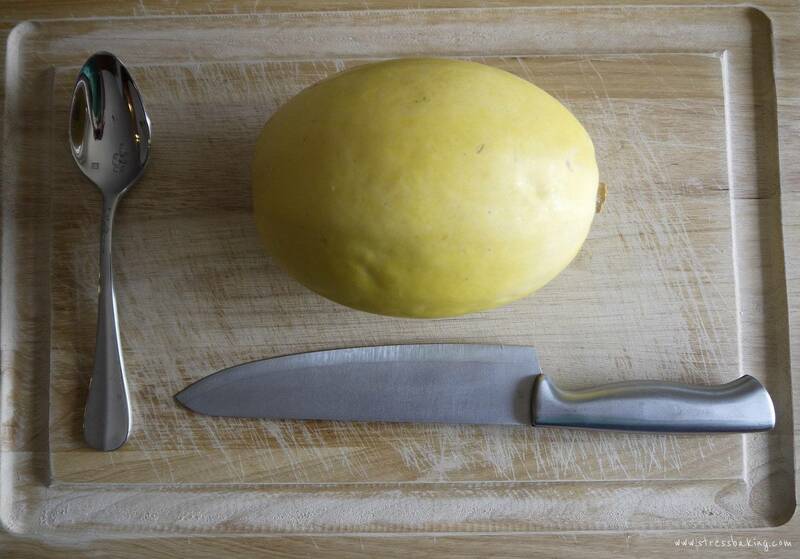 I’ll never forget the first time I bought a spaghetti squash. It was like watching an alien trying to figure out life on another planet because I had absolutely no idea what to do with it. Should I boil it whole? Smash it with a hammer? Was I supposed to throw the thing off a roof to crack it open? Thankfully, there’s this thing called “the internet” and I found some tips and tricks. Over time, I tried different methods and the one I’m going to outline for you today is my personal favorite. For those of you who are thinking “What the hell is a spaghetti squash and why should I care?”, let me enlighten you. 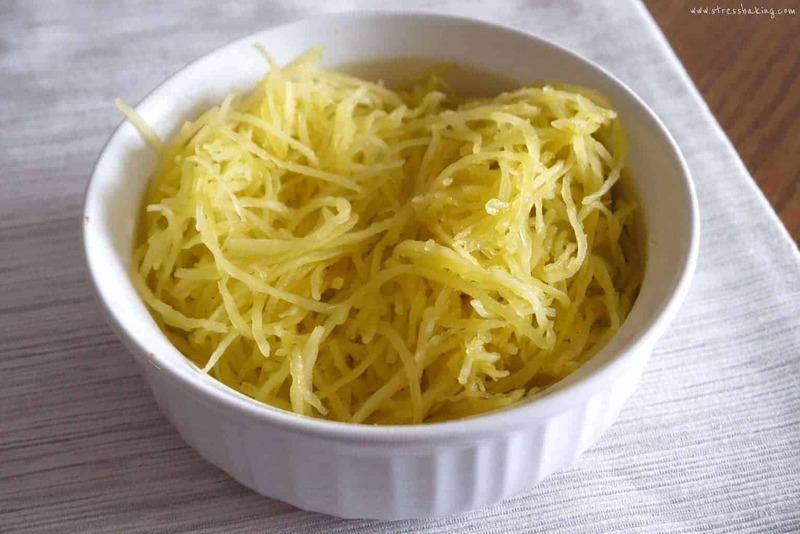 Spaghetti squash is a rock hard, yellow winter squash whose flesh separates into long strands resembling angel hair pasta when cooked. It has a mild flavor which makes it easy to pair with any number of toppings. It’s personally my favorite low-carb alternative to pasta, and it’s perfect for a gluten-free diet (and cheaper than GF pastas!). All you need to cook a spaghetti squash is a little muscle, a large knife, a spoon, a baking dish, olive oil, salt and pepper for flavor. 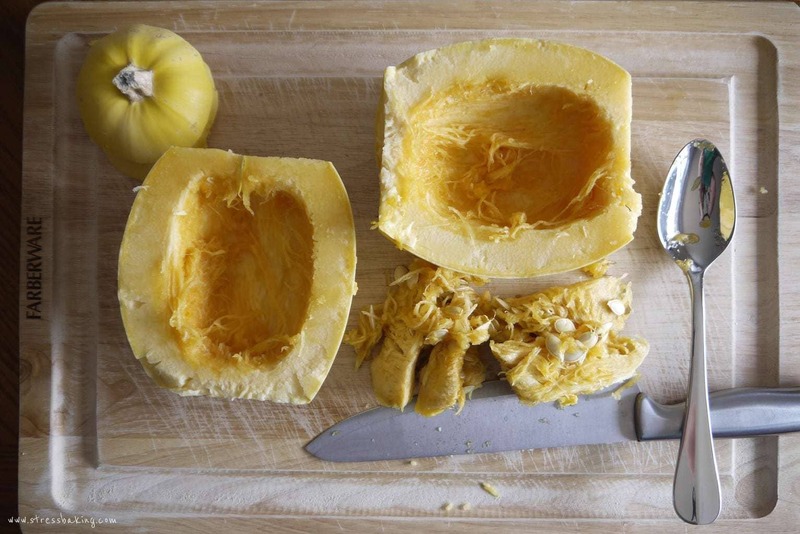 First, use a large, sharp knife to cut off both ends of the squash. Now cut the squash in half length-wise. This is where that little bit of muscle comes in – I’m not kidding around when I tell you this thing is rock hard. Be careful, and if need be enlist the help of a nice strong friend. 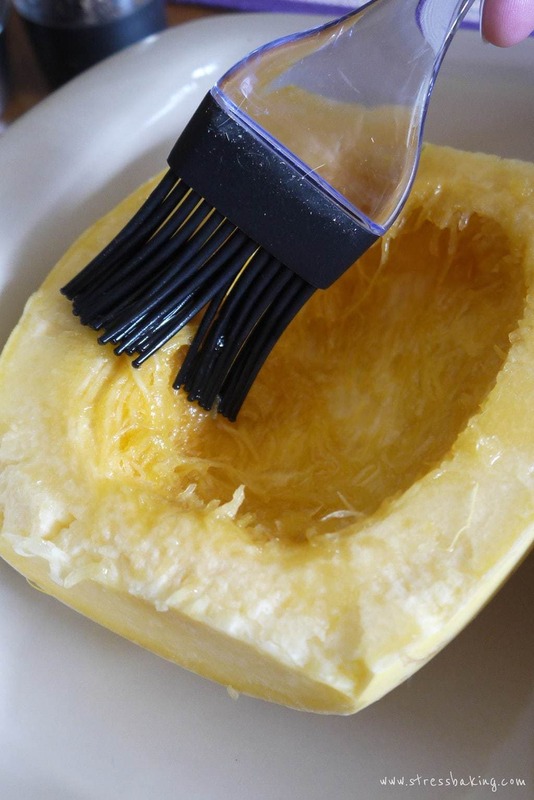 Use a spoon to scoop out all the seeds from each half. 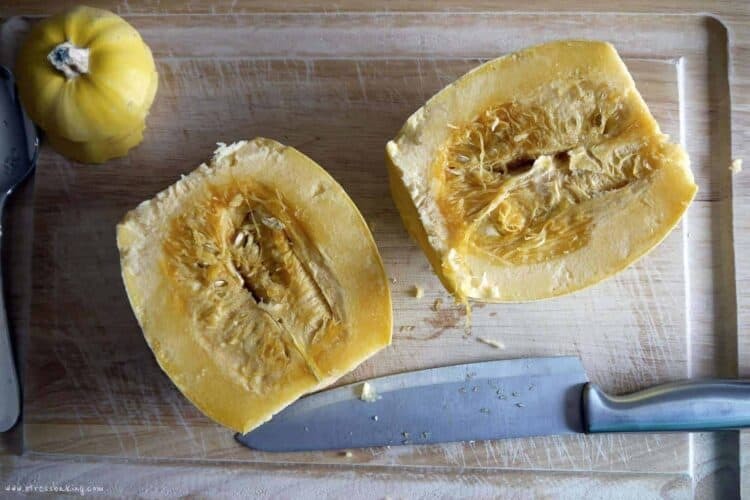 If you’d like, you can save them and place them on a baking sheet with a little olive oil and spices to roast at the same time you cook the squash (you’ll only bake them for about half the time of the squash). Place the halves in a baking dish side by side with as snug a fit as you can manage – this makes it easier when you go to scrape out the flesh later. I like to place them with the cut side up simply because it makes removing them from the dish easier after they’re cooked. Most people recommend placing them cut side down with a little water in the dish to keep it from drying out, but I’ve actually never experienced that myself so I don’t find it to be necessary. But to each his own! Brush a layer of olive oil on the fleshy side of each half. Add a little kosher salt and crushed pepper to each to add a subtle hint of flavor. Cover with foil and bake at 375°F for about an hour. 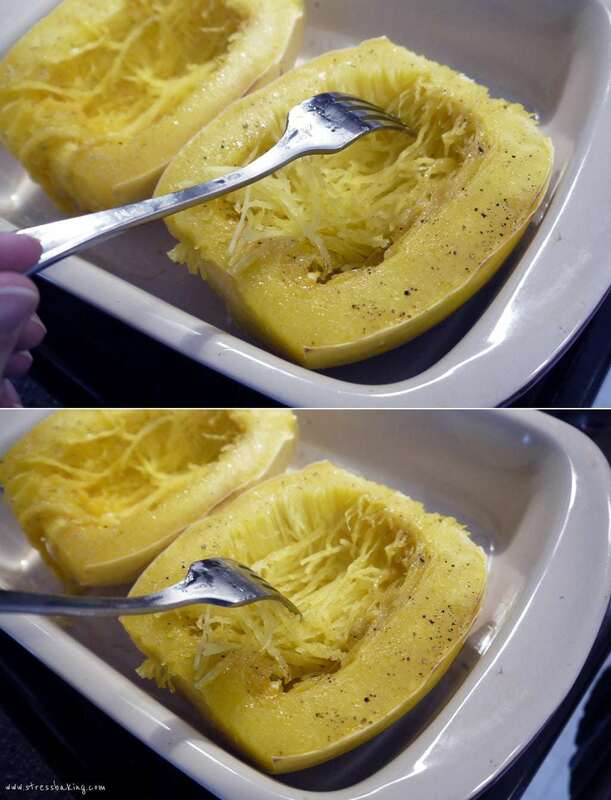 Once you remove the dish from the oven and let the squash cool enough for you to handle, use a fork to scrape out the fresh. You want to scrape it out lengthwise, otherwise you’ll end up with little tiny “noodles”. I usually scrape what I can while they’re still lying in the baking dish, and then tilt them on their ends to scrape out the rest. Place in a serving dish and season with more salt and pepper, if desired. 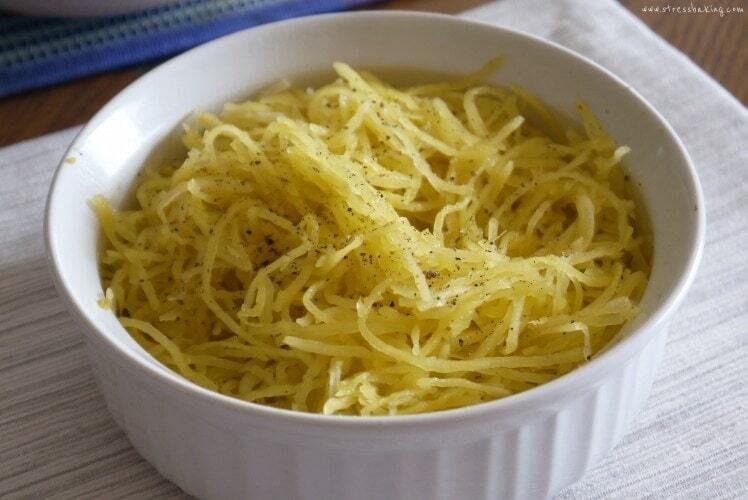 I also like to add a little butter, garlic salt and Parmesan – it makes for such a delicious side dish! You could also top it with your favorite sauce and add some grilled chicken to turn it into a fantastic main course. Get creative with it – I have faith in you. 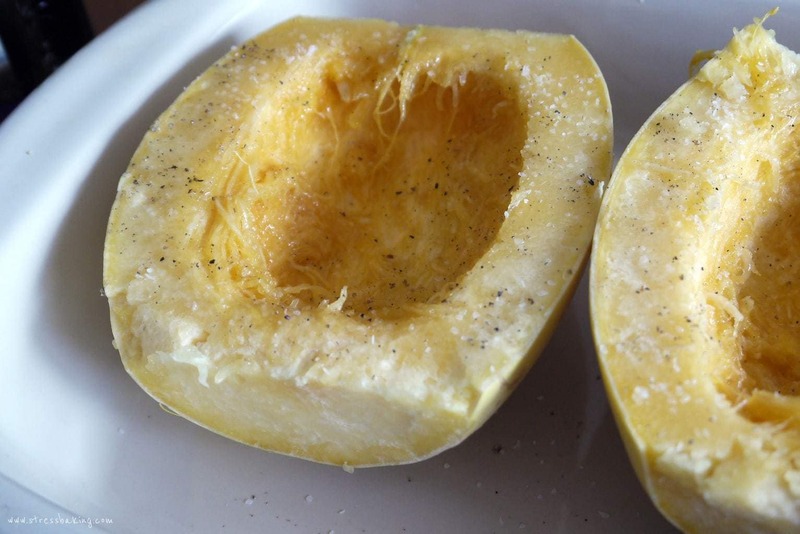 My favorite way to prepare spaghetti squash in the oven! 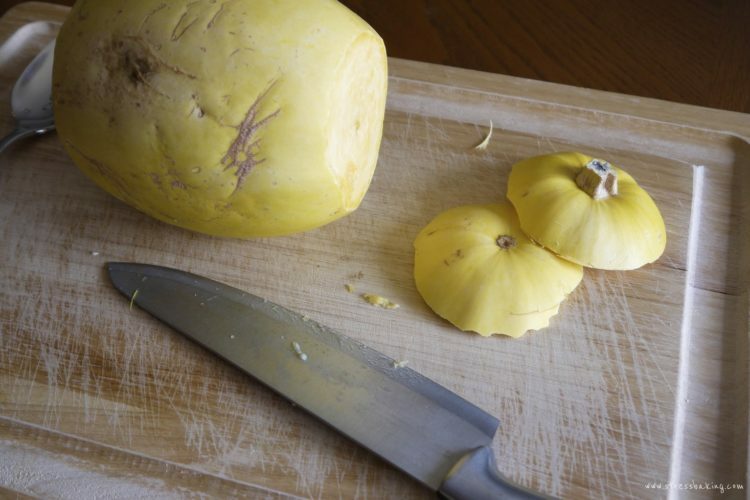 Use a large, sharp knife to cut off both ends of the squash. 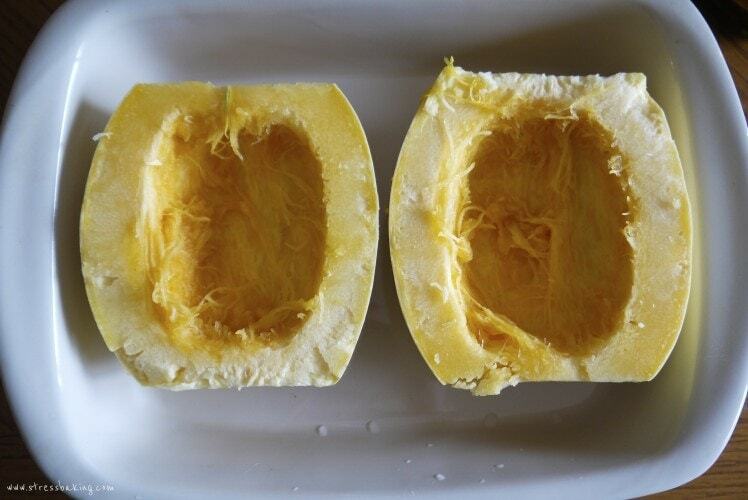 Cut the squash in half length-wise. Use a spoon to scoop out all the seeds from each half. Place the halves in a baking dish side by side with as snug a fit as you can manage, cut side up. simply because it makes removing them from the dish easier after they’re cooked. Brush a layer of olive oil on the fleshy side of each half and add a little kosher salt and pepper. Cover with foil and bake for about an hour. If you want it more tender, stick it back in the oven for another 15 minutes. Once you remove the dish from the oven and let the squash cool enough for you to handle, use a fork to scrape out the fresh lengthwise. Place in a serving dish and season to taste. Enjoy!